The Mears family rule served Glenn Mears well when the recession hit. The rule: You must work in the real world for five years before joining the family dealership business. So Glenn Mears became a certified public accountant at a big firm in Cincinnati. Those years as a CPA instilled a lot of fiscal discipline in Mears, who later went to work for his father and uncle. He eventually bought one of their Honda stores; added Nissan, Lincoln-Mercury and Suzuki stores -- and staffed them all light. So when sales crashed in 2008, Mears trimmed not one person from his Parkway Auto Group, based in Dover, Ohio. He froze wages and reduced overtime instead. "We told people, 'Your job is safe,' " said Mears, now 52. "I think that was one of the keys to our success." His second major strategy? Don't mess with customer touch points. He did drop one of two newspapers and cut a few cable stations from the waiting lounge TV. But the free Starbucks coffee service -- the only available Starbucks in all of Tuscarawas County, said Mears -- is still there. Free pickup or loaners for service work remained. "Our customers needed reassurance," he said. Mears cut expenses elsewhere. 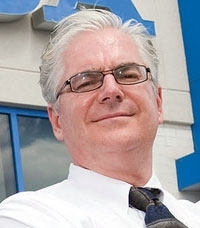 He owns some of the dealership property outright and slashed rent to the stores. He cut his own salary to zero, where it remains. Mears paid more attention to temperature settings. Lights and computers were turned off more often. He worked with his computer vendor to trim costs. Total cuts in 2008 and 2009 amounted to 10 percent, Mears said. Parkway trimmed an additional 6 percent during the first four months of 2010. "When we were making really good money, I was making sure it was being reinvested in the company, paying down debt," Mears said. "All of that gave us cushions we could rely on when this happened." In 2009, the Honda-Suzuki part of the operation even lost a little bit of money when the poor economy coincided with other problems. But this year, Parkway is back on track. After setting volume and profit records in March, Mears now anticipates 2010 will be his best year yet. He has begun to give pay increases. When Mears thinks about the ride back up, he smiles: "Wow, is this going to be fun or what."